After the success of Green Book, the prospect of another film in which a racist gets redeemed after meeting an extraordinary person of color is enough to elicit groans and eye-rolls. Hollywood has often tried to portray racism as a result of intentional hate and malice, ignoring its institutional and at times invisible qualities, completely divorced from conscious hatred and built into the very fabric of our society. 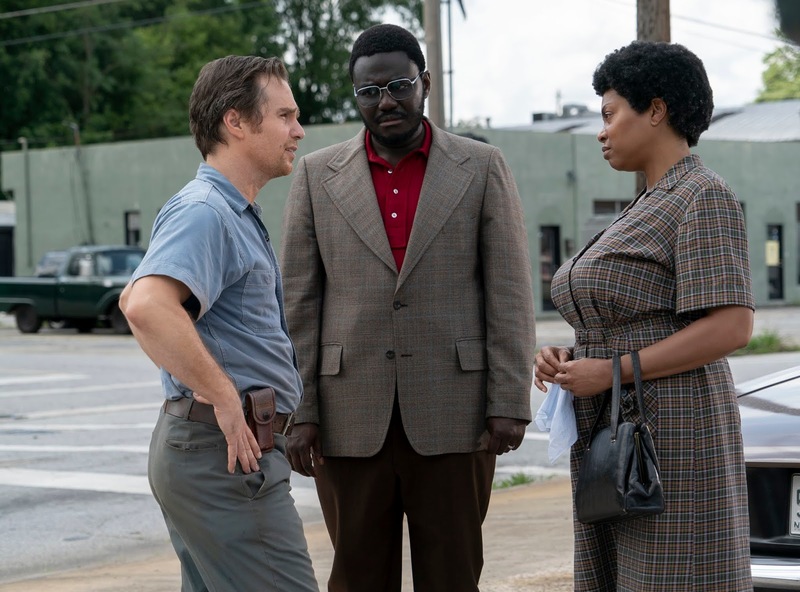 While Robin Bissell's The Best of Enemies absolutely takes a micro rather than a macro look at racism in America, it avoids many of the pitfalls that Green Book fell into. The story is somewhat well known here in North Carolina - how black civil rights activist Ann Atwater (Taraji P. Henson) became close friends with C.P. Ellis (Sam Rockwell), the local president of the Ku Klux Klan, after serving on a board together to come up with a solution for improving black schools in Durham in 1971. The resulting conference lead to Ellis resigning from the Klan and helping to bring integration to Durham schools, an issue he had previously fought against. If you think it sounds like another "redeem the racist white man" movie, you'd be partially correct. To its credit, however, while the film is very much about listening to one's enemies, it is very much not engaging in the kind of disingenuous "very fine people on both sides" rhetoric that is its own special brand of racism. The Best of Enemies does not necessarily exonerate Ellis, showing in the end that he still has to grapple with the system of white supremacy that he helped build and uphold by creating the first KKK youth corps in America. The film does not pretend that what Atwater and Ellis did in any way ended racism, or that their story provides any sort of blue print for "listening to racists" in order to solve racism. What it does is tell a remarkable, self-contained story that actually takes the time to acknowledge the systemic nature of white supremacy, and that the battle is far from over. Films like this often serve to make racism seem like a thing of the past, their happy endings absolving white people of responsibility for a system of white supremacy that still very much exists today. The "charette" at the center of the film (a meeting that brings two opposing sides together to listen to one another) is not shown as a template for giving quarter to the ideas of racists, because the film acknowledges that the only ones there who really had anything to learn were the white people. Yet the film never goes so far as to employ white savior tropes, and Ann Atwater is never portrayed as a "magical African American friend" who redeems Ellis, which already sets the film apart from the likes of Green Book. As portrayed by Henson, Atwater is a fierce advocate and community organizer. That her tenacity eventually wins Ellis over takes a back seat to her efforts to better her own community, and Henson is a force of nature who digs down deep and delivers a terrific performance. It would be great if Hollywood would acknowledge racism for the complex problem that it is, rather than simply a matter of redeeming one racist at a time. But The Best of Enemies doesn't try to tell us that Atwater and Ellis' friendship changed the hearts or minds of any other racists. It's simply a lovely story, and less a testament to a white man's change of heart than a portrait of one very real woman's tireless advocacy and how it lead to integration and an opportunity for better education for the black children of Durham. It may be a rather straightforward melodrama, but it's a largely affecting story of two people who beat the odds, a bigoted man who needed to open up and listen, and the extraordinary woman who made him hear what he needed to hear, and made a difference in one small Southern town. 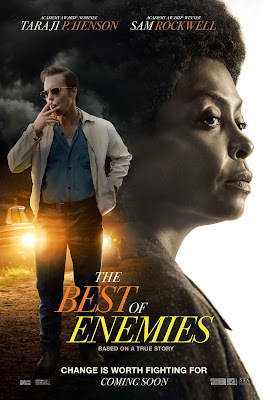 THE BEST OF ENEMIES | Directed by Robin Bissell | Stars Taraji P. Henson, Sam Rockwell, Anne Heche, Wes Bentley | Rated PG-13 for thematic material, racial epithets, some violence and a suggestive reference | Opens Friday, April 5, in theaters nationwide.